Give your next mixed media project or card an elegant textured background with the Botanical 3D Texture Fades Embossing Folder. 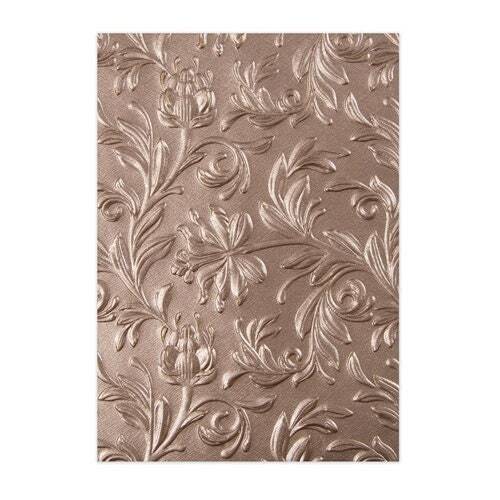 There is one large embossing folder featuring a large botanical pattern that measures 4.5" x 6.5" x .25". The embossing folder is from the Alterations Collection by Tim Holtz for Sizzix and can be used with the BIGkick, Big Shot and Vagabond machines sold separately. Use the folder with a single Cutting Pad and the machine's included Platform also sold separately. Use with vellum, metallic foil, cardstock or paper.